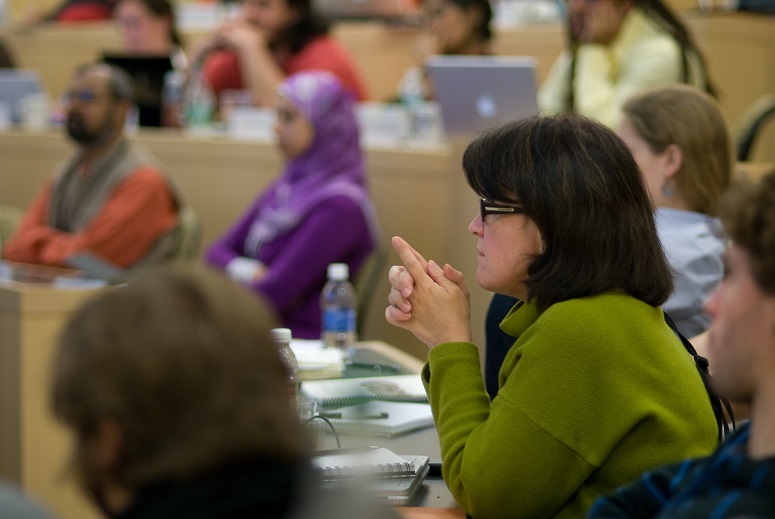 Applicants for ICNC’s classroom-based curriculum fellowship are expected to develop a curriculum for a full term course on civil resistance or a shorter unit on civil resistance that, at minimum, covers five 90-minute sessions over the course of minimum of 5 weeks as part of the undergraduate or graduate course. The course should offer students a full course guide with learning objectives, themed modules, relevant readings, exercises, or simulations directly relevant to the field of civil resistance. Each accepted proposal for a full course or at least a five week unit on civil resistance (taught individually or co-taught with another instructor) will be supported with the ICNC stipend of $1,300. Interested in developing and teaching online courses? Check out the curriculum fellowship call for online courses. Interested in developing and teaching hybrid courses, blending classroom-based and online instruction? Check out the curriculum fellowship call for hybrid courses. Adult educators and trainers who might work in civil society organizations, but have academic-based training or pedagogical and teaching experience, particularly working in regions and countries with restrictive civic spaces or conflicts. 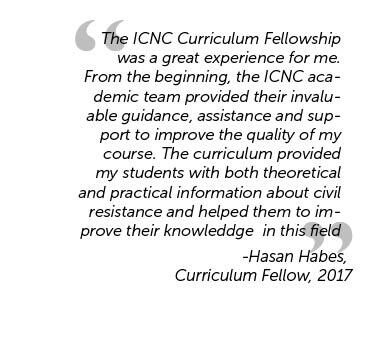 Teaching for 2018-2019 ICNC Curriculum Fellowships is expected to take place either in Fall 2018 or Winter, Spring, or Summer 2019. To be considered applicants should review ICNC recommended list of resources, fill out the online application form, submit CV and curriculum proposal, and other information as requested. To be considered applicants should fill out the online application form, submit their CV and curriculum proposal, and other information as requested. Application deadline: May 27, 2018 for courses that will be offered in Fall 2018 or Winter, Spring, or Summer 2019. The fellowship grants will be disbursed in two equal installments. The first installment will be made after the course begins, the student enrollment is confirmed and the syllabus with a civil resistance component has been satisfactorily reviewed by ICNC. The second installment will be made after the classroom-based course ends and ICNC receives fellow’s final report and results of students’ evaluations pertaining to their learning on civil resistance and course assessment.